A long-running battle over how to manage potential fish habitat on commercial forestland could be coming to a head — although it isn’t clear if the solution will satisfy either forestland owners or environmentalists. To be clear, there is not much argument about streamside buffers where salmon, trout and other fish are readily found, thanks to state and federal rules stemming from the landmark Forests and Fish Report. Buffers are designed to save trees that serve the needs of fish — including insects for food, shade for cool water and eventually down trees that form pools for resting as well as hiding places and spawning areas. Environmentalists contend that it is important to protect unoccupied fish habitat as well as areas occupied by fish at any point in time. If salmon populations are to rebound, salmon fry could need extra space to grow and develop, says Jamie Glasgow, a biologist with Wild Fish Conservancy. That means larger buffers should go where fish habitat can be found. Of course, timberland owners don’t want to leave large buffers on small stream segments where fish would never go. For them, perhaps hundreds of millions of dollars in commercial timber could be left standing under new rules, depending on how the state’s Forest Practices Board comes down on this issue of fish habitat. The board is scheduled to take up the issue again with some kind of action planned on Aug. 9. The Forest and Fish Report was incorporated into state law by the Washington Legislature, and federal agencies adopted those concepts as a statewide “habitat conservation plan” to protect species listed under the Endangered Species Act, including chinook salmon. One of the big arguments about fish habitat revolves around how to determine just how far upstream fish would likely go and where they would be deterred under various natural conditions they encounter, such as streamflow or natural barriers such as waterfalls. The Forest and Fish Report anticipated that a map would be developed with all stream segments designated as either fish habitat or not fish habitat. After several years, such a map was developed in 2005, based on the size and steepness of the streams, using the best information available. It soon became apparent, however, that fish were being found in areas marked as non-habitat on the maps. Other areas designated as habitat were sometimes unable to support fish. Some fish-bearing streams were not even on the maps, and some streams were in the wrong place. I wrote about the efforts by Wild Fish Conservancy to correct some maps three years ago (Kitsap Sun, Sept. 27, 2014). Previous maps had proved to be a problem as well, even before the Forest and Fish Report (Kitsap Sun, May 28, 1996). The maps are still used as guidance, but buffer determinations must be made for each logging or development project based on actual site conditions. If a stream is 2 feet wide and the steepness is less than a 20 percent — or 16 percent in some areas — it is assumed that fish can get there. But — and here’s the rub — an allowable fall-back method is to identify the presence of fish, either through snorkel surveys or by “elecrtrofishing,” which involves putting a nonlethal current in the water to stun the fish. Where fish are located, the area is designated as fish habitat, along with waters that extend upstream to a natural “break,” such as a waterfall or a stream confluence that would prevent fish from going any farther. Much history surrounds this issue, and all sides should be given credit for working through many thorny habitat problems through the years. Nobody wants to go back to a time when the spotted owl was a symbol for conflict about whether forests were mainly for jobs or fish and wildlife. 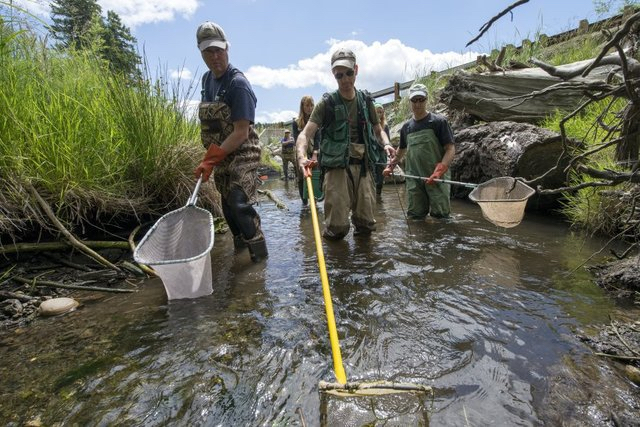 As for fish habitat, experts have renewed their attempt to come up with reliable and objective methods to identify the break points between habitat (known as “Type F waters,” which stands for fish) and non-habitat (“Type N waters”) without the costs and impacts of surveying every stream for fish. Environmental groups became impatient with the effort — or lack of effort at times — over the past 12 years — or more if you go back to the Forest and Fish Report. The matter has gone into formal dispute resolution, as provided by the Forest and Fish Law, and it now is up to the Forest Practices Board to provide a resolution. The result is that many miles of fish habitat are getting little or no buffer protection, he argues. Where mistakes are made and small buffers or no buffers are allowed, it will take decades before the trees grow back to become good habitat again. In mediation talks, the various parties — landowners, environmental groups, tribes and governments — have come to consensus on the overall framework to identify break points where the fish habitat ends, but the details are still unresolved. Karen Terwilliger, senior director of forest and environmental policy for the Washington Forest Protection Association, said it is important to remember that these discussions are not about streams where adult salmon will go to lay their eggs. “It’s the tail end of where the fish might be,” said Terwilliger, whose organization represents large timberland owners. The areas in dispute are generally small streams mostly occupied today by resident fish, including various species of trout and tiny sculpins. The break point between fish and non-fish areas should be a location where the last fish is equally likely to stop above and below that point, she said. The scientific standard is that the break point should be accurate 95 percent of the time, as required by adaptive management provisions of the Forest and Fish Law. Environmental groups prefer to avoid methods that rely upon people finding fish, which may or may not be present at the time of a survey. It should be possible to define habitat conditions suitable for fish whether or not they are there at a given time. Scientific information has evolved to where predictions can be made about where fish will go, Terwilliger said, but there are still questions about what conditions create a barrier to fish. A level of scientific certainty is required before changes can go forward. If a rule change is proposed, it will need to undergo environmental review, a cost-benefit analysis, a small-business economic impact statement and public hearings. Peter Goldman, director and managing attorney at Washington Forest Law Center, said the adaptive management process should be more than a system of delays. Only recently have things been moving in the right direction, he added. “The timber industry is powerful,” said Goldman, who represents environmental groups. “They don’t want anything to change. Stephen Bernath, deputy supervisor for forest practices at the Washington Department of Natural Resources and chairman of Forest Practices Board, said the board is moving forward with the help of scientists. New ideas and new technology are being brought into the discussion with the goal of seeing whether a variety of physical parameters alone can be used to identify fish habitat with high probability. At the Aug. 9 meeting, the board is scheduled to get an update on the progress and to act on staff recommendations about the breaks between fish and non-fish waters. After that, a formal process will begin to incorporate changes into policies, rules and guidance.